Remember when I wrote this post? And I went on and on about how much I LOVE LOVE Hokas and how I will never run in anything else? All that is still true but I am about to get a lot more specific. I am sure you have all heard the buzz about Cliftons. The new "it" shoe. Totally unlike anything Hoka has made before. My friend Shane just wrote about them over on his blog. He is a new Hoka convert. 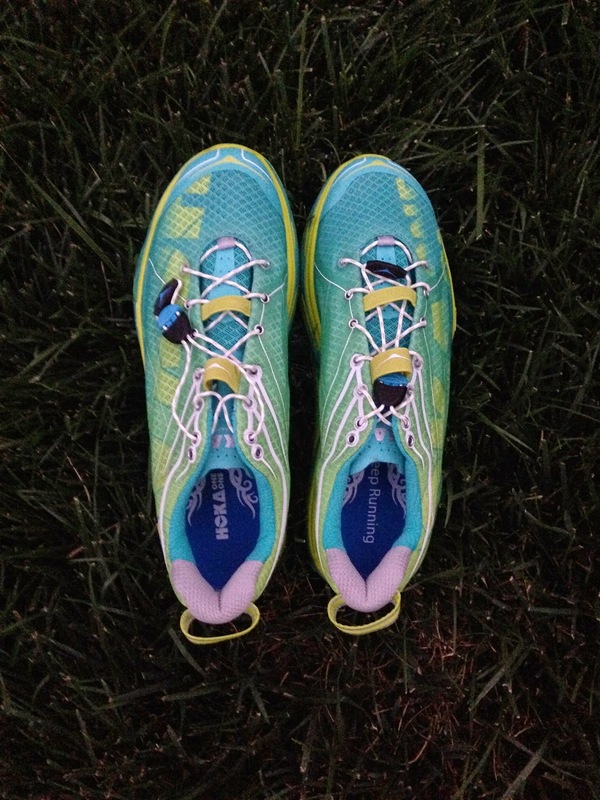 I recently connected with Hoka One One and after listening to me go on and on and on (and on) about how much I love these shoes, they agreed to send me a pair of their newest shoe for me to try. I was expecting the Cliftons. However, I heard that due to the popularity of this shoe, they had a limited amount of shoes to provide for a review (only to those above mentioned super human ambassadors) and I wouldn't be getting those. Instead, I got the Huakas (MSRP $150) to review and provide my honest opinion after road (trail) testing them. At first, I was disappointed. I went out and bought the Cliftons (MSRP $130) while I waited. (Yes, using real cash money!) I have been wearing a size 11 in Hokas but a Hoka rep at the Road Runner San Diego store insisted I belong in a 9.5. I took them out for an 8 mile run along the coast. Umm..no. Too tight! Took them back thanks to Road Runner's AMAZING return policy! Got a size 11 but I had to get men's because the Women's just didn't seem wide enough. But they are not as cute - CLEARLY!!! I wanted to give the right size a fair shot too and took them out on another run along the coast, also 8 miles. And something happened that has never happened to me before. My shoes BIT me! 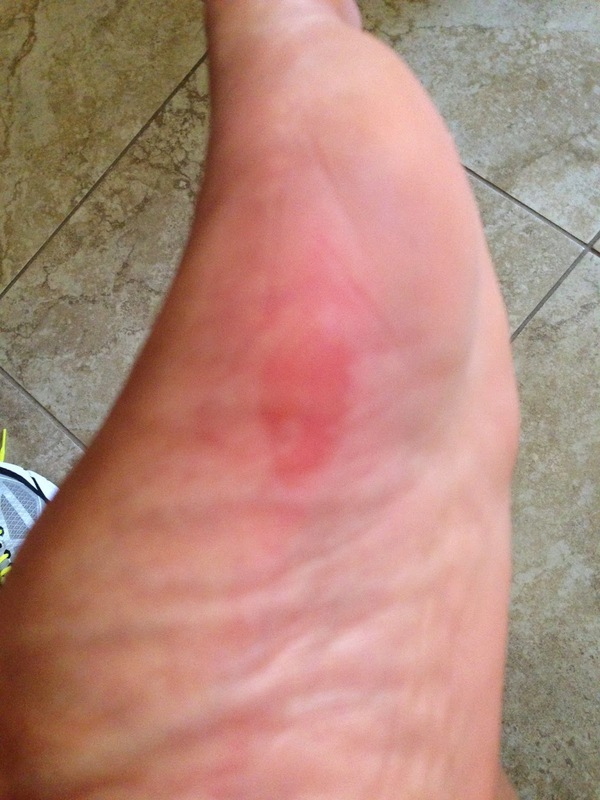 A blister...I could feel it form around Mile 5 and I complained the rest of the 3 miles. A mean blister right? So it turns out I must over pronate and have wide-ish feet. And even the 1/2 cm difference between the Cliftons and the Huakas make a difference. So I returned the Cliftons too for my beloved Bondis. Now this doesn't mean the Cliftons won't work for you. They just don't work for me and one thing I have learned from this exercise is that just because you LOVE a shoe brand doesn't mean every shoe in that brand will work for you! 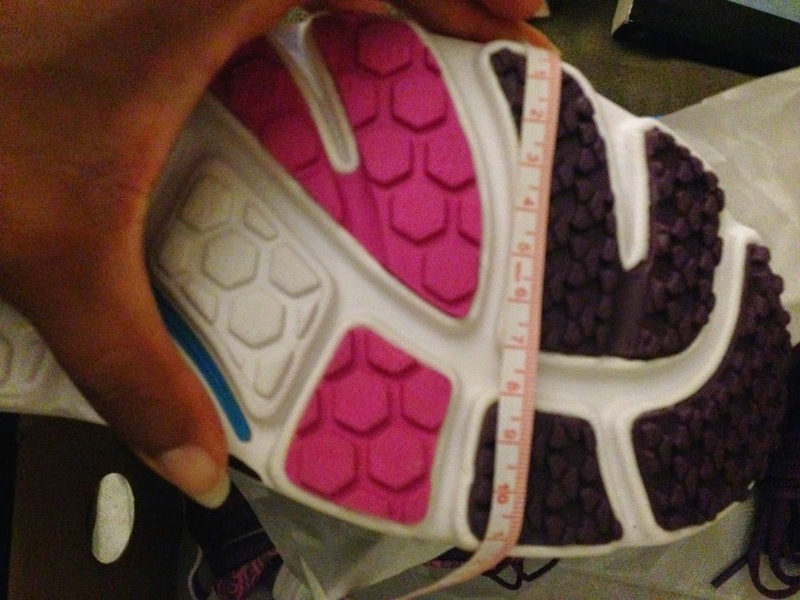 I also learned I am a size 11, darn it! Now onto the Huakas! I am so so so glad it worked out that I got these because I am not sure I would have tried these if I hadn't been sent them. The Huakas are a hybrid trail and road shoe. What does that mean? It means that they will work equally well for both. A lot of bloggers and shoe reviewers talk about the mid-sole and the meta rocker and while I appreciate all of that, I don't really get it and I know how it feels on my foot. So I will tell you about the Huaka in that way. Now check out the soles side by side. The Huakas have outward diamonds and sunken in diamonds. Both work together to grip your feet to a trail surface and a road surface. It has the lowest heel-toe offset of an Hoka model. This means you can use this awesome shoe for ANYTHING - tempos, fartleks, long runs, trail runs. Awesome! 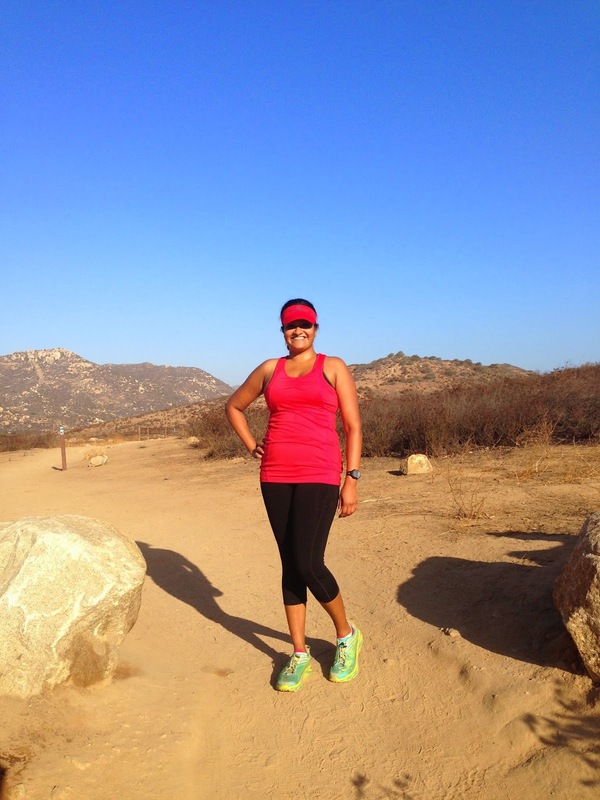 I took them to the Lake Hodges trails to try them out and felt so secure and steady in them. So light and so gushy. Gushy like the Bondis and not as stiff as the Conquests. 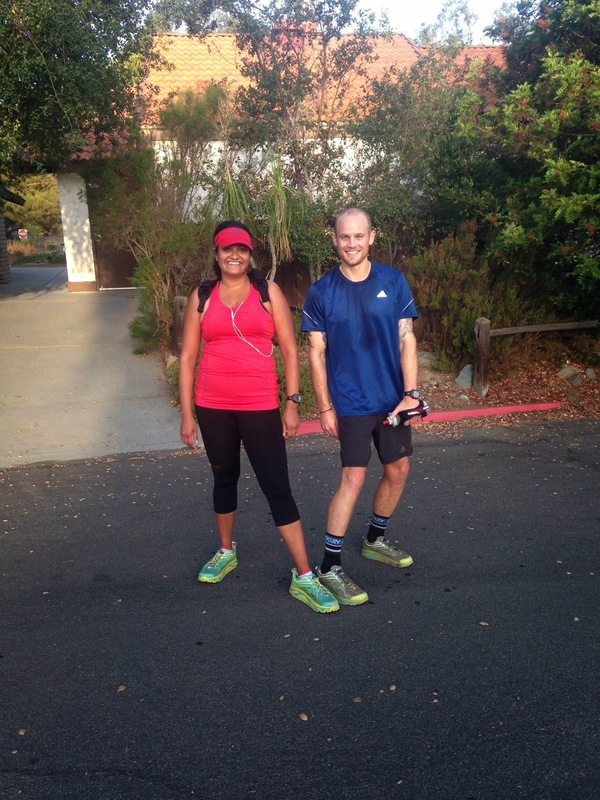 We ran into this guy while on the trails and he too was wearing Huakas and plans to wear them for his first trail Ultra - the Lake Hodges 50K. While his are way dirtier, he said he has run several times in them and LOVES them for trails too. Okay, so they work on the trails. How do they perform on the road? I took these beauties out for another 8 mile run (I really need to start running longer!) 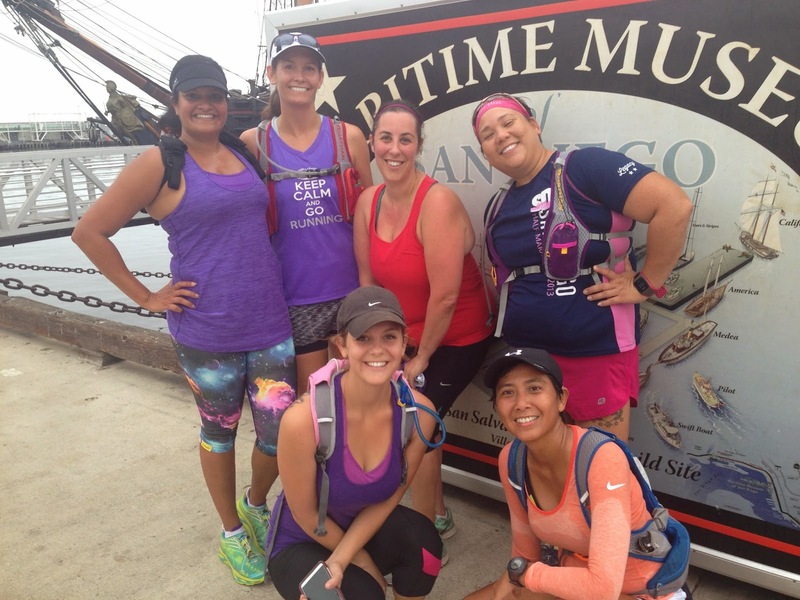 at 6:00 a.m. with my Moms Run this Town group. This time on the road! And yes, those are my Spandits! And how did they do? Even with a healing blister, they felt awesome! I felt light and (relatively) fast! My feet look GINORMOUS! 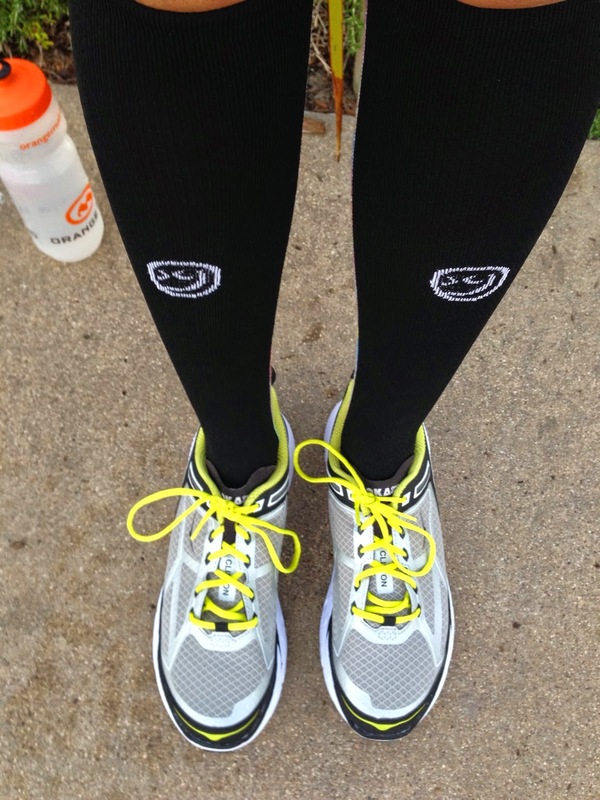 But they felt great and today, the day after the long run, my feet feel GOOD! So, which shoes for you? The super light, slightly narrow and super fast Cliftons? Or the kinda gushy, kinda light and super versatile Huakas? 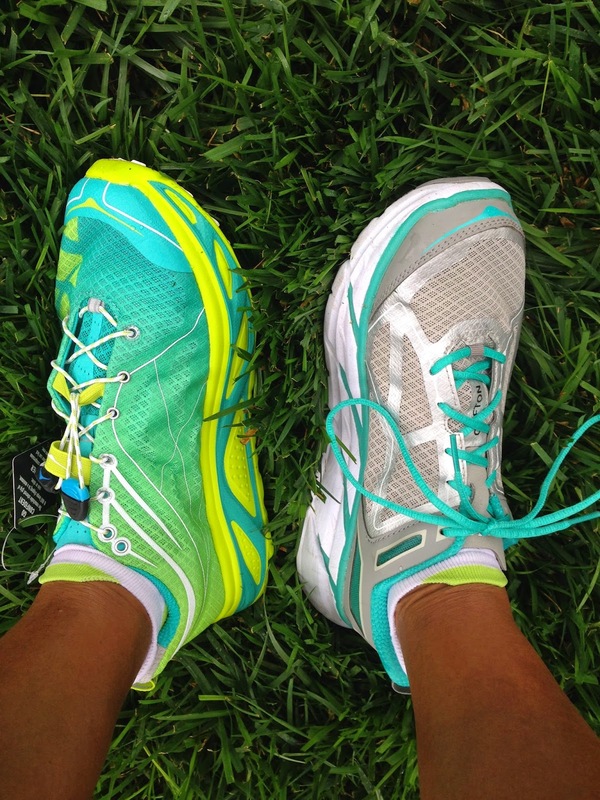 Both good shoes but for me, the Huakas seem better made and better for my foot and my style of running. But I have heard rave reviews for the Clifton too. So I am curious for you to try both and let me know which ones you prefer! 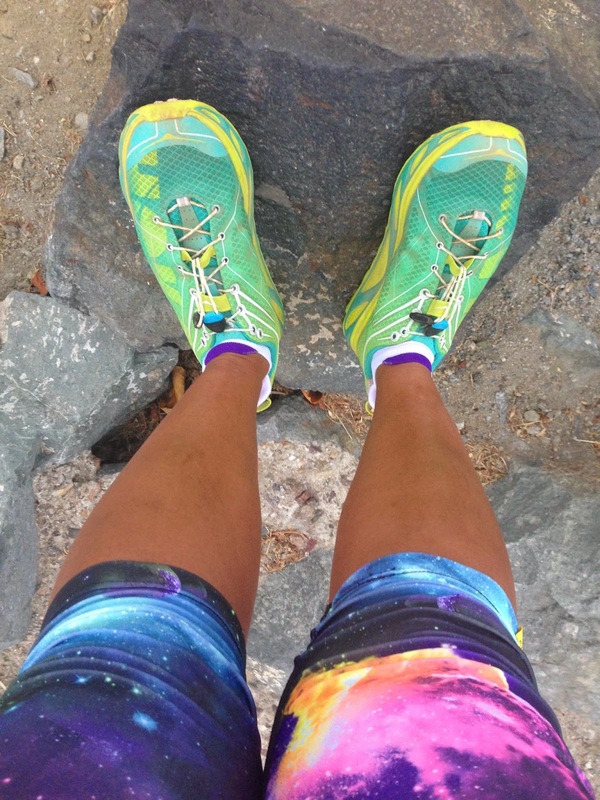 Are you a Hoka runner? Do you run trails? Road? or a little of both? Very helpful review, I need to go and try the new models on. I enjoy the Bondis but I am not sure on sizing for the other models. I like the idea of a road/trail hybrid. I LOVE Bondis and I surprised at how much I like the Huakas. They feel like a trail shoe on the trails and a road shoe on the road. Weird! What shoes do you wear Sue? Thanks for your honest review! I used to be a New Balance gal and now I'm really into Brooks Pure Flow! I totally agree with your advice: "just because you LOVE a shoe brand doesn't mean every shoe in that brand will work for you!" That is so true! Thanks for the review! I still haven't tried Hokas. I've been running and walking in minimalist shoes for over 6 years, but now want to give the cushioned zero drop wide toebox models a try for the longer days. Just got a pair of Altra Torins yesterday. Definitely different from my Vibram FFs, New Balance Minimus, etc. How do you like those Altras?